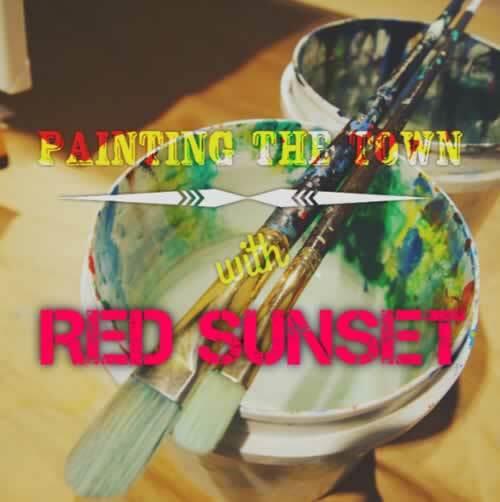 Painting the town red connotes negative thing, but painting the town with red ‘Cactus Sunset’ is very positive. You might be wondering “What is she talking about?” Few days ago, while walking along the Old Town Scottsdale‘s Artwalk where obviously all the galleries and art exhibits are, we saw something great happening in one of the art gallery called, Art of Merlot. Pretty cool Arizona, isn’t it? We noticed that they conduct painting classes daily, paintings on display have posted schedule of the class and the price. There are couple of paintings I like and my husband encouraged me to take one, I was undecided but I know I will enjoy something like that. Soon enough, I found myself signing up for the “Cactus Sunset” class, it was for 2 hours at the price of $35, not bad for a class. They provide the canvas, acrylic paint, brushes, easels, apron, and teach you simple painting techniques and outline which is perfect for first timers and beginners like me. You can also order in advance for wine and cheese plate that you can enjoy while painting, makes your class a real relaxing moment. It was very relaxing by the end, after hours figuring out how the paint and brush strokes work for a specific visual you want to see, it becomes easier and easier. The instructor is really awesome teaching us how to paint and all, very easy to follow, and get inspired painting! It is not a real fine art painting class but it surely help you get started. I’d definitely go for another class! You can book your first or next class on their website here.